Kiki Smith was born in Nuremberg, Germany, in 1954, and grew up in New Jersey. She lives and works in New York. Inspired by early studies in film and glass, and by work as a puppeteer, an industrial baker and an emergency medical technician, Smith began showing her art with the influential artist’s collective, “Collaborative Projects” in the early 1980’s. 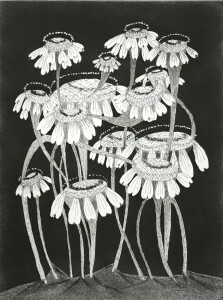 First recognized for her innovative work concerning the human body, Smith is a prolific printmaker, and has experienced working at several different printshops throughout her career. She began work with Harlan & Weaver in 1997 with the five-plate, twenty-foot “Destruction of Birds”, published by Thirteen Moons. Since then, Smith has worked on several more projects with Harlan & Weaver, including the first of a group of animal prints, “Immortal”, 1998, and the fifteen-print set “Blue Plates”, 1999. Smith has embraced the delicacy and sensitivity achieved with a finely etched line, and has produced prints that are simultaneously fragile and self-assured. Prints published by Harlan & Weaver share a common thread: most are representations of hair, in either animal or human form. 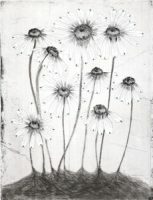 Layering line upon line with short etches, and employing sandpaper as a way to add to and remove aquatint tone, Smith works and reworks the etched plate, adding depth and realism to the final image. In the etchings of animals, as in “Fawn” 2001, or “Ginzer” 1999, the texture of the hair is rendered with careful observation. “Falcon”, 2001, shows similar study of the graceful overlapping of a bird’s feathers. In etchings like “Two”, 2002, and “The Remains”, 2003, the individual lines of the face and beard are personal descriptions of her subject. Smith has shown extensively in the United States and abroad. She has been in several important solo and group exhibitions, including the Whitney Biennial in 1991 and 1993; Kiki Smith at the Louisiana Museum of Art in 1994; Paradise Cage: Kiki Smith and Coop Himmelblau at the Museum of Contemporary Art, Los Angeles, in 1996; Kiki Smith: Convergence at the Irish Museum of Modern Art and Kiki Smith at the Modern Art Museum, Fort Worth, Texas in 1997; My Nature: Works with Paper by Kiki Smith at the St. Louis Art Museum in 1999; Regarding Beauty: A View of the late Twentieth Century at the Hirshhorn Museum and Sculpture Garden and The American Century: Art & Culture 1950-2000 at the Whitney Museum of American Art, both in 1999-2000; Telling Tales at the International Center for Photography in 2001; the Whitney Biennial in 2002; a major print retrospective, Kiki Smith: Prints, Books & Things at the Museum of Modern Art, New York, in 2003-2004; Kiki Smith: A Gathering, 1980 – 2005, which was exhibited in five major art museums, over the course of 2006 – 2007; and most recently, Sojourn at the Brooklyn Museum of Art, New York, in 2010. Smith’s work is included in a long list of public and private collections, including the Art Institute of Chicago; the Brooklyn Museum of Art; the Fogg Art Museum, Harvard University; the Metropolitan Museum of Art; the Museum of Contemporary Art, Los Angeles; The Museum of Fine Arts, Boston; the Museum of Modern Art, New York; the New York Public Library; the San Francisco Museum of Modern Art; the Tate, London; the Victoria and Albert Museum, London; the Whitney Museum of American Art; and the Yale University Art Gallery. 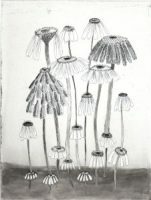 She has done several visiting artist workshops at universities and studios around the country, and has taught printmaking at New York University, Columbia University and Temple University. She is represented by The Pace Gallery, New York.